We invite you to explore India - the Land with infinite beauty ! Whether you soar high into Himalayas or peer under the ruins of the Ancient monuments dotting the landscape of India, you will cherish the experience long after your visit ! This India Travel Guide on Basilica of the Sacred Heart of Jesus, Puducherry is free from any commercial interest! This site is dedicated to promote India - the vast subcontinent, its glorious past, magnificent landscape and its infinite variety. 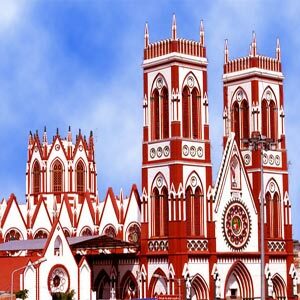 A magnificent example of neo-Gothic architecture, the Sacred Heart Church at Pondicherry is a renowned pilgrimage center for Roman Catholic Christians. The rare stained glass panels of the church depict the life of Christ and saints of the Catholic Church. This church was established in 1908; the centenary celebrations were celebrated during 2008-2009. This church was built by the French missionaries. The Eglise De Sacre Coeur De Jesus Pondicherry, as it is referred to in French, attained the status of basilica in 2011. This Catholic Church is one of the finest churches of Pondicherry. The Basilica measures 50 meters long and 48 meters wide. It is 18 meters high and has a Latin rite cross shape in the aerial view. The church has attractive glass windows, twin spires and a huge exterior. The glass windows are encircled with terracotta craft. The interiors are a magnificent blend of scarlet, moss green and milky white and the entire structure is held by 24 columns. Terracotta motifs adorn the walls - typical of south Indian architecture. Glass paintings of the 28 devout saints related to the sacred heart of Jesus include that of Joan of Arc. A striking statue of Madonna is placed at the right side of the high altar. The statue is draped with a blue sari. There have been additions to the original church complex over the past decades - a Parish Hall, Adoration chapel and a Grotto to Our Lady of Lourdes. Sunday: 5:30 to 7:30 in the morning and 5:15 in the evening. Almighty and everlasting God, look upon the Heart of Thy well-beloved Son and upon theacts of praise and satisfaction which He renders unto Thee in the name of sinners; and doThou, in Thy great goodness, grant pardon to them who seek Thy mercy, in the name of thesame Thy Son, Jesus Christ, who liveth and reigneth with Thee, world without end.